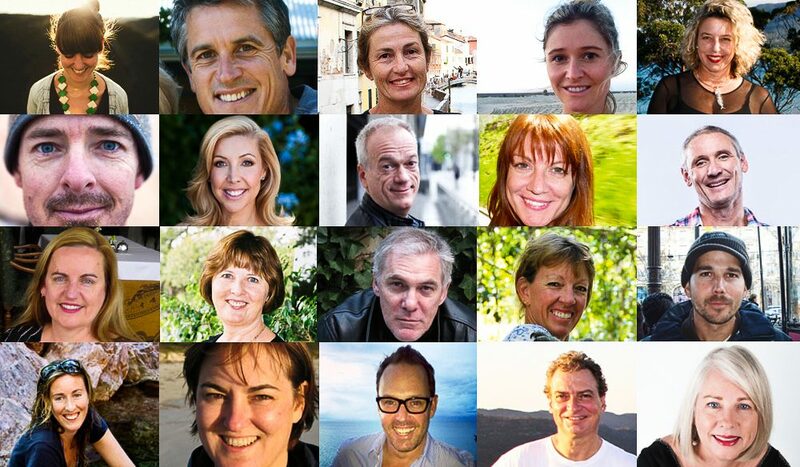 Top row (l-r): Jen Pinkerton, Max Anderson, Sue Gough Henly, Georgia Rickard, Inger Vandyke; Second row: Andrew Bain, Catriona Rowntree, Tom Neal Tacker, Louise Goldsbury, Peter 'Spida' Everitt; Third row: Christine Salins, Suzanne Medway AM, Keith Austin, Fiona Harper, Craig Tansley; Bottom: Fleur Bainger, Lee Atkinson, Brent Wallace, Daniel Scott, Kerry Heaney. We gathered 20 of the most in-the-know, well-travelled people in the country to bring you the ‘100 Greatest Holidays of Australia‘. Darwin-based journalist Jen Pinkerton has worked in the features department for Prevention, was a reporter for The Canberra Times and won an Australian Food Media Award in 2010. A regular contributor for Australian Traveller, Jen lectures in writing at Charles Darwin University and runs workshops at the Northern Territory Writers’ Centre. Any travel that involves the Top End and indigenous culture has her heart. Max Anderson is the editor of Adelaide Hills Magazine and writes for publications including Sydney Morning Herald, The Age and The Guardian. He is the former editor of Ansett’s in-flight magazine, Panorama, and deputy editor of the travel section of The Sunday Times. He has won a number of awards including AITO British Travel Journalist of the Year and two North American Travel Journalist Awards. Award-winning travel writer and photographer for more than 25 years, Victorian Sue Gough Henly has written for The New York Times, Travel & Leisure, The Guardian and many major Australian publications, including Australian Traveller and International Traveller. She is the author of Australia’s Best Places travel app, and has been a book editor in New York and Seattle. Author, producer and Australian Traveller editor was a lifestyle journalist prior to joining the team two years ago. Before living and breathing Australian travel, she contributed to Cosmopolitan UK, GQ, Sunday magazine, Sydney Morning Herald, and the Sunday Telegraph. Her work has been syndicated globally and she is a radio regular. You can see her speaking about Australian travel on SKY News. Photojournalist and eco tourism pioneer Inger Vandyke has contributed her images and stories to over 20 publications including Australian Geographic and National Geographic. Growing up on the Great Barrier Reef, her passion lies in island and marine conservation. She has led photography and natural history trips in Australia and has been involved in the establishment of Christmas and Cocos (Keeling) Islands as destinations. An expert on all things adventure and outdoors, Hobart-based travel writer Andrew Bain is the author of Lonely Planet guidebooks Walking in Australia and Cycling Australia and was awarded the Australian Society of Travel Writers’ Best Australian Story in 2010 and 2013. He has cycled from Cairns to Cape York, hiked the Larapinta Trail, the Overland Track, and traversed the Cape to Cape Track many times. Specialties: Where do we begin? With more than 18 years as a travel reporter for Channel Nine’s Getaway, Catriona Rowntree is an authority on all things travel. Previous to that, she worked as a researcher for BRW, in various newspapers, on radio and other TV programs such as Wonder World!. Now based in rural Victoria, she has penned two books including Catriona’s Australia: 100 of My Favourite Aussie Locations, and blogs on her website catrionarowntree.com.au. Tom Neal Tacker serves on the Advisory Board of the Australian Festival of Travel Writing and is a frequent guest speaker for Australia’s Travel Writing Festival and Melbourne’s International Writer’s Festival. He has edited and contributed to several books including Gourmet Touring Around Australia and Red Dust & Wanderlust and is editor of online magazine nakedhungrytraveller.com.au, which is all about ‘honestly naked’ travel writing. Named Best Travel Writer at the 2013 National Travel Industry Awards, Sydney-based Louise Goldsbury has been a journalist for 20 years. Louise is the editor of Travel Daily Cruise Update, a regular contributor to Sydney’s Sun Herald as well as Australian Traveller and International Traveller. This cruise aficionado takes around 10 cruises a year and writes about it on her website cruiseylife.com. Host of travel television program The Great Australian Doorstep, Peter ‘Spida’ Everitt is probably best known for his 16 years on the footy field, but his new gig sees him travelling the country by 4WD, caravan, tent and motorhome. He is based on the Gold Coast, hosting the morning breakfast show on Gold FM, is the face of Coleman Australia’s Bigfoot camping range and launched fishing e-magazine XXXX Anglers in 2013. Editor of the Food and Wine section in The Canberra Times for eight years, Christine Salins is a highly respected restaurant reviewer and judge, regular wine columnist and travel writer and has been a journalist for over 30 years. She runs her website foodwinetravel.com.au, where she shares her food and travel stories and recipes. During her participation in this panel, she also relocated to Queensland – busy! President of the Wildlife Preservation Society, Suzanne Medway has been given the remarkable honour of Member of the Order of Australia in 2013. She is also editor of the society’s quarterly magazine, and three books Conserving Australia’s Wildlife, Conservation Victories and Battles Yet to Win and 100 Years of Saving Australia’s Wildlife, as well as having previously worked for the Observer in London. Sydney-based Keith Austin has been a journalist for more than 35 years working as the travel editor, features writer, chief sub, reviewer and columnist for Sydney Morning Herald. He was editor of four editions of Good Food’s Pub Food Guide for NSW, has worked for many other publications including The Sunday Times, Readers’ Digest, Good Weekend and The Guardian, and written two young adult books and edited two cookbooks. Fiona Harper is a freelance travel writer and photographer whose articles have been published in many magazines, newspapers and websites globally, including Foxtel Travel Channel, CNN Travel and REX’s in-flight magazine. This Cairns-based girl is widely travelled – she’s travelled Queensland by mountain bike, motor bike, foot, air, road and sea, and also has her own blog, travelboatinglifestyle.com. For the past 17 years, Melbourne-based travel journalist Craig Tansley has written for many prestigious titles including Sydney Morning Herald, Financial Review and the Sunday Times in London, not to mention been a regular contributor to Australian Traveller and International Traveller. Spending about six months on the road every year, this travel buff’s speciality is high-end adventure and remote travel. Feature and food writer for the Sunday Times Magazine, Fleur Bainger has also worked on travel podcasts for Lonely Planet and has written for Outback Magazine, OUTthere Magazine, The Australian’s Travel and Indulgence, Cruise Passenger, Qantas’ Travel Insider and Australian Traveller. She has been a presenter and reporter on numerous radio programs on the ABC and a news journalist at Nova. Lee Atkinson has been writing about travel for 23 years as former editor of magazine The Open Road, author of several books such as Australia’s Best National Parks, On the Road: 40 great driving holidays in Australia and Frommers guidebook Sydney Free & Dirt Cheap. She is a life member and past president of the Australian Society of Travel Writers and contributes to many publications including The Sun Herald. If you ever need some advice on how to travel in style, Brent Wallace is the man to talk to. He is the director of multiple Australian travel companies including travel agency Fairlights and the co-founder and General Manager of Riche Hotels & Resorts, a luxury travel tour operator collaborating with the most spectacular and stylish hotels and resorts across the world. He also writes his own travel blog, wheresbrentbeen.com. Award-winning travel writer Daniel Scott won the accolade of Australian Travel Writer of the Year 2011 and was listed as a finalist in 2013 for the Kennedy Journalism Awards for Outstanding Travel Writing. He is currently a regular contributor to Wall Street Journal, Fairfax Media, Telegraph Media Group, CEO Magazine and Australian Traveller. He is also the creator and tutor of a travel journalism course at the British College of Journalism and Morris Media. Kerry Heaney is president of the Australian Travel Writer’s Association and writes regularly for Escape Travel, Jetstar Magazine, Where Magazine, Get Up & Go, Selector Food Wine Travel and Tiger Tales. She edited Go Camping Australia magazine for more than 10 years and is ranked number seven in the Top 100 Australian Food Social Media Influencers. Her blog chronicles her food and travel experiences: eatdrinkandbekerry.blogspot.com.au.